Pirelli HangarBicocca presents Remains, Italy's first major solo show of works by Sheela Gowda (born in Bhadravati, Karnataka, India, 1957; lives and works in Bangalore). 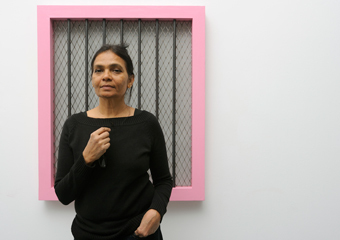 Over the course of the years, Sheela Gowda has developed in her practice a constant dialog and exchange between local artistic traditions and international forms of art. Featured in the monumental and undivided space of the Navate (9,500 square meters), the exhibition offers a unique opportunity to discover more than twenty years of Gowda's production. In addition to new works, the show includes a wide selection of site-specific installations and sculptures, as well as watercolors and prints, ranging from 1996 through the present day, giving shape to an unprecedented experience of her practice. The exhibition is curated by Nuria Enguita, Director of Bombas Gens Centre d'Art, Valencia; and Lucia Aspesi, Assistant Curator at Pirelli HangarBicocca.